...... jpg file format. JPG to PDF Converteris very fast, quick, affordable and easy to use PDF application that is specially designed to batch convert jpg to one PDF document, containing all the listed pictures or individual PDF files. 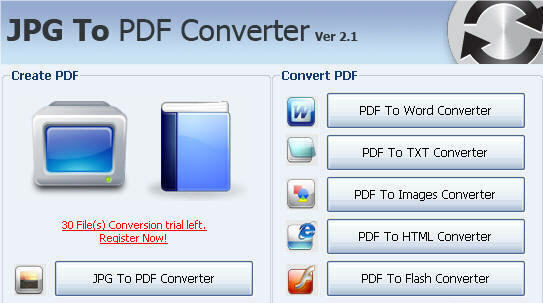 JPG to PDF Converter has the ability to change any jpg file format to PDF file. * Friendly and self explaining step-by-step user's interface allows you to convert jpg file into pdf document. * If you have multiple jpg files to convert, you can select batch jpg files for converting in once. * JPG to PDF converter tool support all pictures, photos, images, snapshots, stills, photographs, snaps, and shots etc, which are in .jpg format for converting into PDF document. * JPG2PDF creator has option to create PDF document of all the listed photos in one PDF document containing all the pictures or individual PDF files. Qweas is providing links to JPG to PDF Converter 2.3.8.2 as a courtesy, and makes no representations regarding JPG to PDF Converter or any other applications or any information related thereto. Any questions, complaints or claims regarding this application JPG to PDF Converter 2.3.8.2 must be directed to the appropriate software vendor. You may click the publisher link of JPG to PDF Converter on the top of this page to get more details about the vendor.